I hope you'll enjoy seeing my job, so for me is it more than a handcraft, also it is my passion. All my jewels are handmade and I use high quality materials. I make all in my workshop in Barcelona. I create jewelry collections thinking in day by day but with a different focus. Also I enjoy make customer orders, creating one of a kind jewels, with an specific feeling and message. Don't doubt and contact me if you have any question! Big and flashy silver ring. Big organic shape ring. Irregular shape. U-shaped band. Textured silver ring Oxidized silver and mate silver. Silver necklace. Rhomb of silver. Mini necklace. Thin chain. Little pendant. Necklace with chain. Thin necklace. Minimalist design. 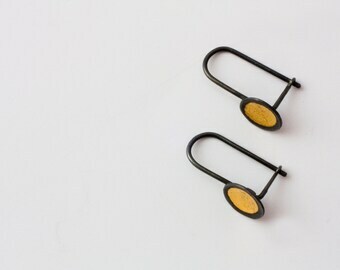 Botton earrings with movement. Polished silver and oxidized silver earrings. Small earrings. Circle with small piece in movement. 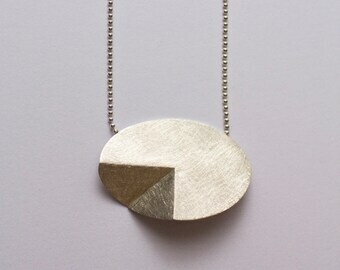 Ellipse necklace. 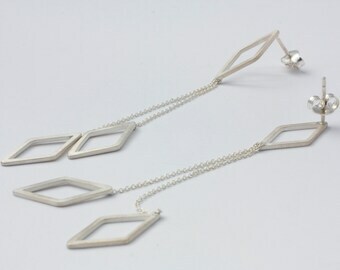 Silver necklace. Geometric shape. Minimalist design. Cute necklace. Ellipse earrings. Button earrings. Geometry. Minimalist earrings. Sculptural earrings. Anatomical earrings. Playing with planes. My workshop. This bench has thousands of drawers and help me to be ordered though it may not seem in the picture. Soldering is one of my favorites process, it has magic. Make some sketches is necessary in complicated pieces. My workshop it's small, but lucky jewelers can work with few space. I work in my little workshop in my home, in Barcelona. I enjoy doing all the process of my jewels, it is important to me create from the beginning and realize the hole process. In this way I can sure all is as perfect as I want! I draw sketches, make models and finally the most exiting part for me: sit in front my bench and make the jewel that I've devise. I work with high quality materials: sterling silver, yellow gold and withe gold; also I include some precious stones in my creations. I understand jewelry as sculpture adapted to the body, like an identity symbol and like a personal treasure. So I put a piece of me in every piece I make. My inspirations are from nature, history, sculpture, architecture, movement and geometry. I try to create special collections, making jewels for every day with a different focus. Also I enjoy make customer orders, creating one of a kind jewels, each one with an specific feeling and message. I design and make step by step all my jewels from my birth city, Barcelona. I always want you to be happy with your purchase, I try to describe my pieces to the maximum and accompany them with descriptive photographs, but it isn't always enough. If you want to make a return, please contact me before 78 hours after receiving your item. All items must be unused and in their original condition (packagin included) and must be sent back by registered mail. Shipping costs will be borne by the buyer. The amount of the purchase will be returned once the return item is received. In the case that it is a specific order from the client there will be no refund. In case of deterioration or breakage of the piece by use contact me, we will find a solution! Buyers will pay applicable tariffs and customs duties. I'm not responsible for delays due to customs procedures. Be sure to enter the shipping address correctly. Each order is sent by certified postal mail, or by express courier if you prefer. The items in stock will be sent within 2 or 3 days once the payment is received.